Editor's Note: Almost all of our communities face -- at some time -- major infrastructure projects, whether a new highway, sewer treatment plant, or, in the case of Glenwood Springs, Colorado, a new bridge. These projects often have significant consequences for the community, and can stir up controversy. Because they're more than just a bridge, highway, sewer treatment plant, etc., planners and planning commissioners get involved. You'll read below Kathy Trauger's account of the effort to replace a key bridge in Glenwood Springs. In reading it, think about how a project like this would be handled in your own city or town. It has been said that bridges are a metaphor for life. 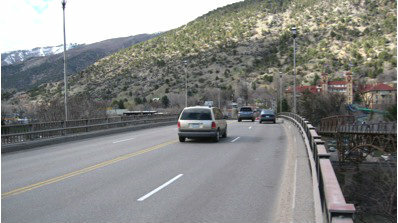 In Glenwood Springs, bridges are our life. Living in a city trisected by two rivers, bridges become an essential piece of our daily routine. When the Colorado Department of Transportation (CDOT), in 2010, deemed the main link into Glenwood Springs, the Grand Avenue Bridge, functionally obsolete with a sufficiency rating of 47.7, placing it into a “poor category by CDOT standards, it came as no surprise to many. 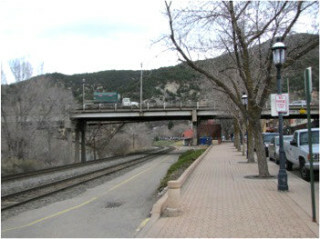 Location of the Grand Avenue Bridge (and parallel pedestrian bridge on its east side) in Glenwood Springs, Colorado. Soon plans were underway to replace the bridge and the neighboring pedestrian bridge using funds from the Colorado Bridge Enterprise Fund (CBE). According to the CDOT, the CBE is a “government-owned business entity within CDOT, with the purpose to finance, repair/reconstruct and replace bridges designated as structurally deficient or functionally obsolete . . ..” However, the decision to replace the bridge was not without significant controversy. The Grand Avenue Bridge was built in 1953 as a two lane bridge with sidewalks on either side. It had an anticipated 50 to 60 year lifespan. Photo from Grand Avenue Bridge looking south towards downtown Glenwood Springs. Circa 1960s. In 1969, the sidewalks were removed to add two additional lanes. 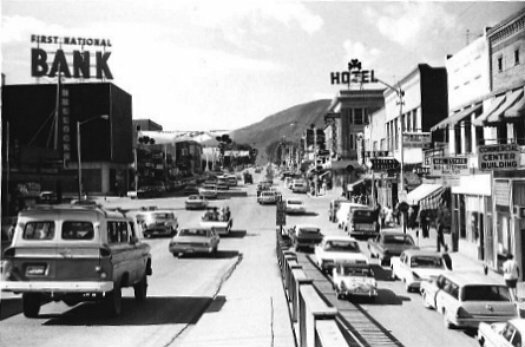 The bridge is part of state highway 82, which also serves as Glenwood Springs’ main street, Grand Avenue. This highway is the primary way to get to other communities in the Roaring Fork Valley including the resort town of Aspen. For decades, city leaders have discussed the need to relocate state highway 82 to somewhere other than our main street. The problem was always a lack of consensus as to where to put such a road. Glenwood Springs is located in a very narrow valley (see photo in my earlier post), and options are extremely limited for placement of a four-lane thoroughfare. Potential relocation sites are wrought with problems. When CDOT earmarked $60 million from the CBE fund for the Grand Ave bridge replacement, a local group calling itself Citizens to Save Grand Avenue immediately began a campaign to reallocate those funds to move Highway 82. Despite being told by CDOT that the funds were only for bridge repair or replacement, the group has persisted. But the bridge project has continued to move forward despite this opposition. Once the final design and National Environmental Protection Agency (NEPA) process is complete in early 2015 it is possible that additional opposition to the bridge will be mounted. The construction of an alternate route could significantly change traffic flow through Glenwood Springs potentially eliminating the need for replacement of the bridge. But extensive repair of the existing structure would still be needed. Would the existing Grand Avenue Bridge remain a safe option for travel until an alternate route could be determined, financing found, and construction completed? Many do not believe that it would. 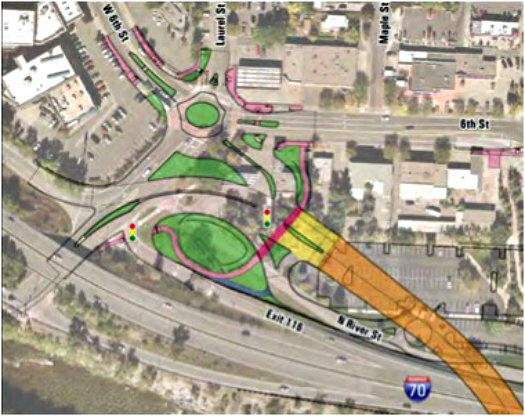 The city’s Comprehensive Plan, revised in 2011, acknowledges the desire for moving Highway 82 off Grand Avenue and recommends continued assessment and planning for an alternative alignment. While the Comprehensive Plan does not recommend a location it states that an area near the downtown known as the Confluence could be compromised if that area was used to accommodate the relocation (see my earlier post, At the Confluence). This is one of the suggested routes proposed by Citizens to Save Grand Avenue. It comes down to timing and money. Would the existing Grand Avenue Bridge remain a safe option for travel until an alternate route could be determined, financing found, and construction completed? Many do not believe that it would. CDOT deemed the bridge functionally obsolete for five reasons. The Grand Avenue bridge has relatively narrow lanes. Photos courtesy of CDOT. 1. Lane width is 9 feet 4 inches. The standard is 12 feet. 2. Clearance over the railroad is 22 feet 6 inches. Current standards require 23 feet 6 inches. View of bridge's clearance over the railroad and street. 3. Clearance over a cross street ranges between 12 feet in some areas to 14 feet 2 inches. The current standard is 14 feet 6 inches. 4. The piers supporting the bridge are less than 6 feet from Interstate 70, which does not allow for adequate impact protection. Additionally, the piers were not designed for impact load. 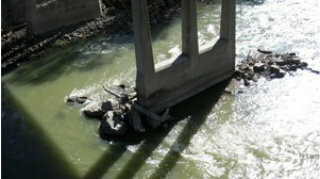 The bridge's piers have been temporarily repaired due to significant erosion. 5. The pier footings that are in the river have been subject to significant erosion. In 1992, repairs were made, but they were intended as a short-term fix to last only eight years. changing the orientation of the vehicle bridge. The design of the new bridge includes a sweeping curve taking the northern landing several blocks to the west to make a more direct connection with Interstate 70. The current vehicular bridge is a straight line from north to south and the existing utility connections needed to be maintained in their current approximate locations. Design of new Interstate 70/U.S. 6 entrance and exit off the bridge. As to the existing pedestrian bridge, the best solution also seemed to be replacing it with a new pedestrian bridge complete with an Americans with Disabilities Act (ADA) compliant double elevator, large enough to accommodate bicycles with trailers (what's more, the existing pedestrian bridge was not capable of carrying the utilities). The local engineer who designed the existing pedestrian bridge made it so it could be deconstructed in three separate pieces and moved to a new location. This is exactly what the city is hoping to do to further enhance our trail system. 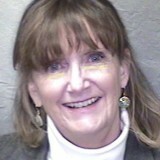 The project got off the ground in 2011 with multiple meetings with stakeholders, citizens, and business owners. This included meetings and briefings with City Council, the Planning and Zoning Commission, and the city’s Transportation and Trails Commissions. As the Chair of the Planning Commission, I have been included on the Project Leadership Team (PLT), an advisory group of citizens and stakeholders, project engineers, and technical consultants. CDOT has been working diligently to keep a everyone posted regarding new developments changes and progress. The engineers and design team have been using the Comprehensive Plan and Glenwood’s Downtown Design Standards to make sure the design is in compliance with current requirements. Rendering of view looking toward the elevators that will access the pedestrian bridge – Illustration courtesy of CDOT. The environmental assessment, a process that takes several months, is underway, although it had been delayed by complex decisions on alignment, design, and ADA considerations. Because of the complexity of the environmental assessment and the lengthy process to obtain permission from the Union Pacific Railroad for temporary easements to allow construction, the project timeline has been pushed back slightly. It is expected that the federally required environmental assessment, will be completed by February 2015. If the environmental assessment has a Finding of No Significant Impact then the project will continue on the current timeline. If there are significant impacts an Environmental Impact Statement will be required. To complicate things even more, CDOT has moved from an obligation-based budgeting process where projects follow the money to a cash-based budgeting process where money follows the projects. It relies on projects being on schedule and within budget. Any variance from the schedule could mean that money is moved from this project to another project, which could put the Grand Avenue Bridge project at risk. Construction mitigation for traffic flowing into and through our town continues to be a concern. CDOT is working with Union Pacific Railroad to gain permission to temporarily remove track on a wye and cut a new access to tie into our downtown. The bridge construction project is using what is termed an accelerated process. It is CDOT’s intention that the bridge will only be closed to traffic for a two month period while they move the final section into place. Despite the best efforts of CDOT, their consultants, and the construction company, the bridge construction will have an impact on our community. However, the accelerated construction period should help significantly. Once complete, the bridge will create a new entrance into Glenwood Springs and provide abundant opportunity for redevelopment on both sides of the river. It is both an exciting and trying time to live in Glenwood Springs. This process of working on such a large project with such consequence to Glenwood Springs, has been a window into the workings of state and federal government complete with promises and hopes, and then reality. This process of working on such a large project with such consequence to Glenwood Springs, has been a window into the workings of state and federal government complete with promises and hopes, and then reality. It has also been a surprising education on the power that a private corporation, like the Union Pacific Railroad, can have on the future of a community. Overall, the partnership forged between the City of Glenwood and CDOT has worked very well, although there tend to be frayed nerves showing on both sides. CDOT is concerned with moving vehicles quickly and safely. 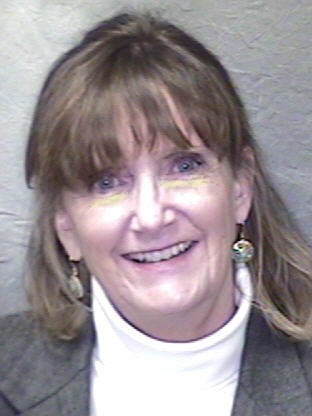 Glenwood Springs is concerned with keeping our identity and character. Due to some prior issues, there are some in Glenwood who have an inherent distrust of CDOT. 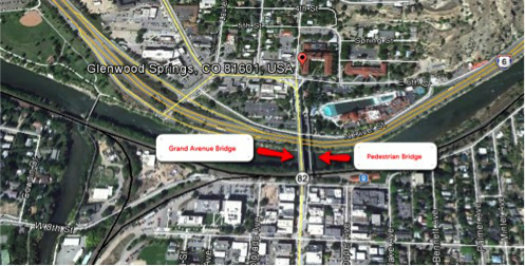 However, the project manager, who happens to live in Glenwood Springs, and consulting team are bending over backwards to make the new Grand Avenue Bridge (and accompanying pedestrian bridge) work for Glenwood Springs. It has been both a fun and frustrating journey. The fun, for a citizen planner like me, is the opportunity to observe and work with a great variety of people at every level: the State Transportation Commission and the Federal Highway Administration; the engineers working on the structure; and the engineers and designers creating the lighting and public spaces. The cooperation between groups has been phenomenal. The very best part will be to see the result that closely follows the dream that many of us had when starting this project. But it has also been frustrating to work with a seemingly rigid corporation that tends to hold the trump card in many decisions concerning our community. However, there is an upside to that as well. It has been an education in negotiation and what works and what doesn’t! For those communities that may be embarking on a project of a similar magnitude, the most important piece of advice I have is communicate. For those communities that may be embarking on a project of a similar magnitude, the most important piece of advice I have is communicate. Establishing a dialogue and rapport is critical to building trust. There must be understanding and communication between all entities involved both on a formal and informal level. A related lesson learned is that, for the most part, public meetings -- like city council meetings and planning and zoning meetings -- don't work well for communication purposes. While they provide opportunity to give information, something more is needed to get the dialogue going. Surprisingly, “Town Hall” style of meetings also did little to build trust. More productive was enlisting the help of a local facilitator for a smaller group meeting at the local pizza place. Other ideas: enlist the help of your local newspaper and radio, start a blog, use social media, and go talk to local merchants. Be persistent and consistent and enjoy the ride!